Streaming Big Data Analytics – Why it Matters? As the speed of business accelerates, organizations are producing increasingly vast volumes of high velocity data in a myriad of formats. Previously, they have had to resort to capturing, storing and then attempting to extract insights from data warehouses after the fact. However, they are beginning to realize the benefits of being able to continuously analyze data as it is captured, in real-time – and take immediate action. From improving their customers’ experience to better 1:1 marketing to preventing fraud – benefits abound. The challenge however lies in the fact that few organizations have the infrastructure to analyze and immediately act on streaming data. 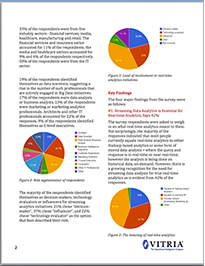 In fact, in a recent survey,41% of the respondents stated that the ability to analyze and act on streaming data in minutes was critical; however, 67% also admitted to not having the infrastructure to support that goal. 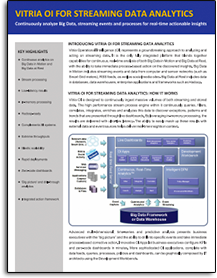 Vitria Operational Intelligence (OI) represents a groundbreaking approach to analyzing and acting on streaming Big Data. It is the only fully integrated platform that blends together capabilities for continuous, real-time analysis of both streaming and stored data, with the ability to take immediate process-based action on the discovered insights. Streaming Big Data includes events and data from computer and sensor networks (such as Smart Grid meters), RSS feeds, as well as social media sites. Stored Big Data includes data in databases, data warehouses, enterprise applications, and frameworks such as Hadoop. Vitria OI’s Hadoop connector allows the solution to work synergistically alongside Hadoop. While Hadoop delivers deep insights into massive volumes of stored data, Vitria OI complements it by providing continuous, real-time insights into streaming data together with the ability to take proactive, automated action.